I recently purchased 2 clay baking pots that are perfect for baking eggs. 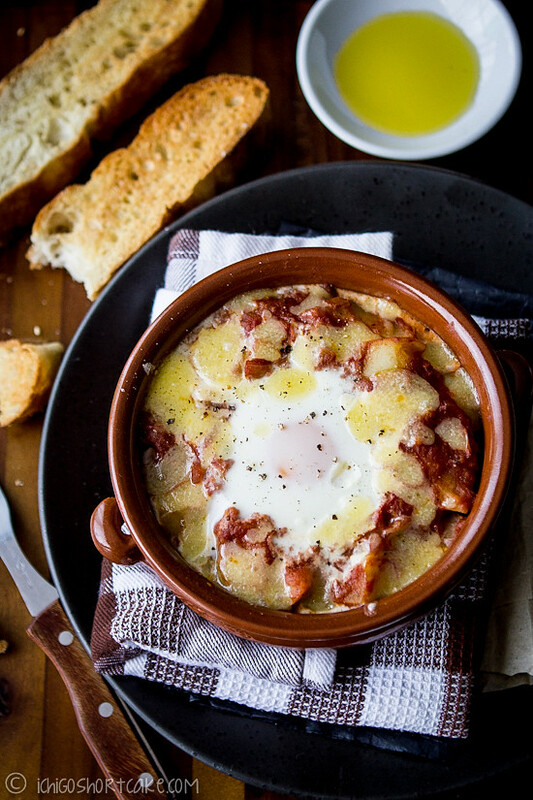 Baked eggs are addictive, especially in this chilling weather. 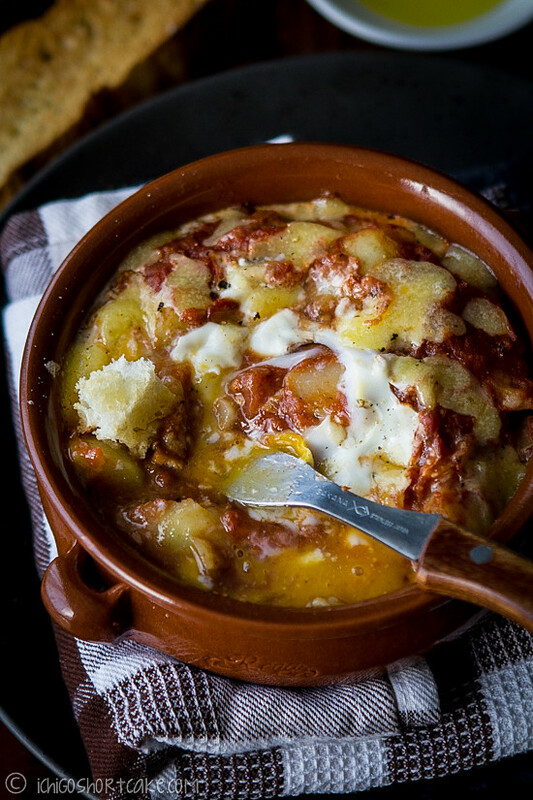 Tasting a piping hot mouthful of oozy egg yolks mixed with soft chunks of tomatoes and baked potatoes is the perfect way to pass a lazy Sunday. A few weeks ago, I also bought a can of skarpsill from Ikea which is a Swedish marinated fish similar to anchovies and I had no idea what to do with it. And then it occurred to me, why don’t I put it with the baked eggs? It turned out that I didn’t quite like the flavour of this fish as it was somewhat…..’rosy’……or ‘herby’ or something. It tasted quite different to regular anchovies, even the texture is quite different. Optional: You can replace anchovies with chorizos or Spanish serrano ham. You can also add in half a large capsicum which needs to be sautéed until soft if you wish. 3. In the mean time, heat a pan on medium high with olive oil, cook garlic and onions until transparent. 4. Add in tomatoes, can of tomatoes, tomato paste and stir. 5. Add in smoked paprika, oregano and stock, tasting as you and make sure you don’t make it too salty (remember the anchovies are quite salty). 9. Transfer items of the frying pan to 2 oven proof pots. Using a spoon, create a small well in the middle of the sauce and potatoes then crack an egg into the well. Question time: Do you like anchovies? 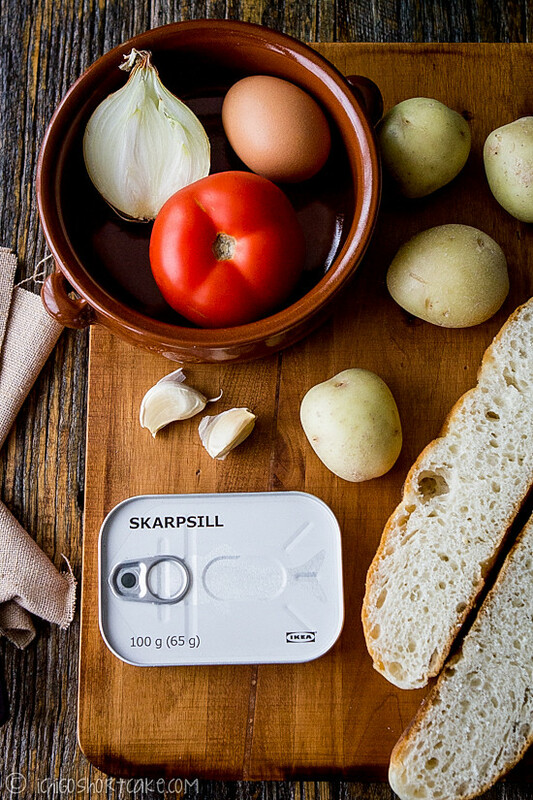 Have you ever tried Ikea’s Skarpsills and do you like it? They look delicious. I have never had baked eggs before but I have seen them lots lately. Not being a fan of anchovies, I think I could quite easily swap them for chorizo and that would be great! Love your clay bakers and this dish looks really good. Haha I used to not like them that much really…they’re a bit fishy and salty for me, but in certain dishes they are pretty nice! Ooh I’ve never seen that product at Ikea before. I usually buy the pickled herring with dill and adore that 😀 This looks great! I HAVE tried anchovies, and I actually like them! My usual midnight snack was toast with melted cheese, tomatoes, and anchovies. SO good! This looks so tasty! I don’t have any clay pots, I think I need to go and buy some soon! Dear heavens I love anchovies. This looks incredible! Yum! This looks delicious and your photo is stunning! Hi Jenny, skarpsill is a sprat I think – it was long time since I tried it but I love tinned fish from IKEA – it’s so common in Sweden (the fish, not IKEA :p) but really difficult to find in France, so IKEA is my trusty supplier of delicious, fishy goodness. I really recommend “matjessill” if you can find it. 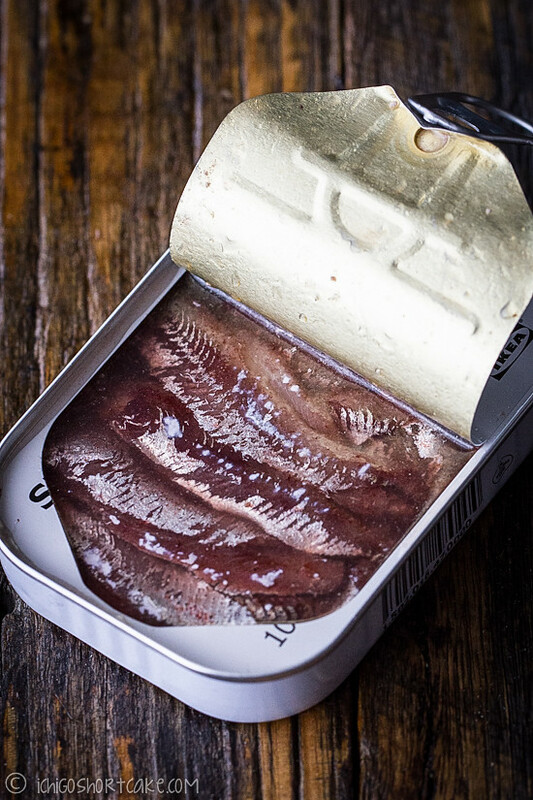 It’s a preserved herring. If you like fish then you should totally make a matjessill salad – I posted one on my blog ages ago. Your pots look fantastic – both the pots themselves and the contents. I’m sure I would have loved them either with anchovies or with skarpsill intead! I like anchovies, although I think the sausage might be a bit better in this dish. Your clay bakers are great! And this recipe is quite nice – thanks. Oooh baked eggs! Haha I have two half-full jars of anchovies sitting in the fridge and I have no idea what I should do with them so this entry came at a great time. Yum! Haha glad it was of some use. 🙂 I really want to make it again, it was so nice! You bought the ‘anchovies’ that Swedes use in a fabulous potato dish called Jansson’s Temptation. It works very well in that dish, unless you are expecting the other kind of anchovies! Oh I didn’t know that’s what it’s used for! When I bought it I just thought it was similar to normal anchovies. 😛 Thanks for letting me know! OK i think that’s it 🙂 I’m RUSHING out to get these claypots lol it’s the 3rd baked egg recipe I’ve seen today hehe ~ I think it’s a sign and you make it look so yummy and easy to make! Can’t wait to make it myself thanks for sharing! Lovely combination! I’ve just start to hanker after anchovies recently, and don’t have recipes for them. Glad I’ve found this. My family and I absolutely loved this recipe, and we also recently had the pancetta version of this as well. Thanks so much. Man this looks really good! I’ll have to try this sometime; I’m currently looking for recipes that deal with fish and this looks great. Now I just need to find a decent priced cooking clay pots. How in the sworld do you get the egg whites to become solid white in 10+ minutes at 200 degrees. I thought I used real eggs.